Happy Friday everyone! I hope you are all having a great week and looking forward to the weekend! It's lent for us at the Karen At Home household so I have been breaking out all of our favorite Lenten recipes. I wanted to share with you an easy and delicious recipe for tuna noodle casserole. It's a hit in our house and I hope it will become one in yours! Enjoy!! Pre-heat oven to 400 degrees. Stir soup, milk, peas﻿, tuna, cheese, noodles, and garlic salt in a bowl. Mix thoroughly. Spread mixture evenly into a glass casserole dish. Bake at 30 minutes until hot. Stir. Mix bread crumbs/stuffing with butter and sprinkle over casserole. Bake for another 5 minutes. Enjoy! Come join me at these fun parties!!! Inspiration Friday at The Picket Fence! Feature Yourself Friday at Fingerprints on the Fridge. Flaunt it Friday at Chic on a Shoestring Decorating! 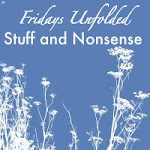 Fridays Unfolded at Stuff and Nonsense! Weekend Bloggy Reading at Serenity Now! Weekend Wrap Up Party at Tatertots and Jello! 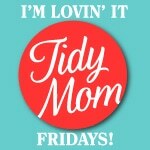 Frugal Friday at The Shabby Nest! Looks so good! I havent made that in years- may need to take your recipe and make it this week! Have a great weekend Karen! I love casseroles and this sounds amazing! I think my family will love this dish! OMG, I grew up eating this!! one of my FAVS!!!! your recipe is so much better than mine!! I LOVE casseroles, but I never get to make them b/c my husband is a big dork and won't eat anything with cheddar cheese. It seems like 98% of casseroles have cheddar in them. This one looks sooooo yummy! !